When a person meets certain criteria, the Social Security Administration pays that person a monthly benefit amount. In order to receive the monthly benefit amount, the individual typically must be disabled, retired, or the survivor of a deceased person. In all of these cases, these benefits can be critical for a recipient, helping them to afford the cost of living and provide for their basic needs. If you think that you may qualify for Social Security benefits, our talented attorneys at The Comerford Law Office, LLC can help you to apply for benefits, or appeal a denied claim. Contact our Chicago law office today for a free case consultation. An individual who is of retirement age and who has paid into the Social Security insurance system during their working years will be eligible for Social Security benefits. A person must be at least 62 years of age to qualify. In addition to the applicant themselves, the spouse of a retired worker, as well as at the minor child of a retired worker, may also qualify for benefits. If a person who has worked under Social Security for a specific amount of time dies, their surviving family members may be entitled to benefits. Those who may be able to receive benefits from a deceased family member’s Social Security record include a widow or widower of at least 60 years old, a minor child, a young widow or widower if the widow(er) has a young or disabled child in their care, a dependent parent, or a disabled widow or widower. The third type of benefit offered by the Social Security Administration are disability benefits. A person can receive disability benefits if they have a qualifying disability or if they are severely disabled to the point where they cannot work and the disability is expected to result in death or last for at least 12 months, and they are of limited income and resources or they have earned enough work credits over their working years. Children and spouses of disabled workers may also qualify for benefits in certain situations. 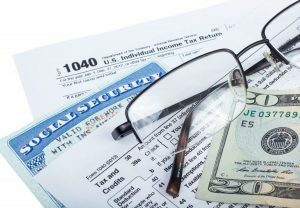 The process of applying for Social Security benefits is confusing, and countless claims are denied every year because of mistakes made during the application process. When you work with an experienced Social Security benefits attorney, you improve your chances of your claim for benefits being approved. In the event that a claim is denied, a knowledgeable attorney can help you to understand your right to appeal, and how to gather critical evidence that will be crucial for a claim’s approval. For an attorney you can trust when you need benefits, call The Comerford Law Office, LLC today. We will work hard for you.